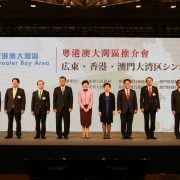 The Secretary for Administration and Justice, Ms Chan Hoi Fan (4th right), attends a symposium in Tokyo, Japan to promote the Guangdong-Hong Kong-Macao Greater Bay Area. Macao welcomes people from Japan and other countries to visit the city in order to gain fresh insights regarding the opportunities arising from the Guangdong-Hong Kong-Macao Greater Bay Area (Greater Bay Area). 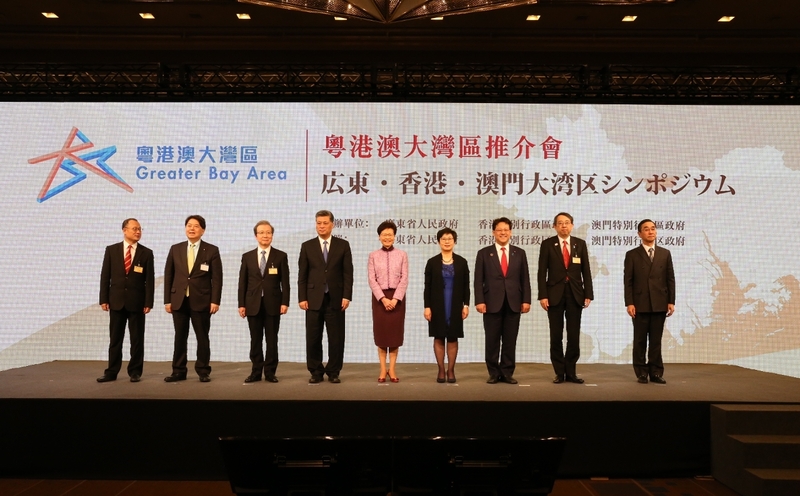 The Secretary for Administration and Justice of the Macao Special Administrative Region (SAR), Ms Chan Hoi Fan, made the comment on Tuesday (9 April) in her keynote speech delivered at a symposium held in Tokyo, Japan, to promote the Greater Bay Area. Ms Chan attended the event on behalf of the Chief Executive, Mr Chui Sai On. The symposium was jointly organised by the governments of, respectively, Guangdong Province, the Hong Kong SAR and the Macao SAR. It was the first such overseas promotional activity held by the three governments regarding the Greater Bay Area, since the launch in February of the outline development plan regarding the city-cluster initiative. Prior to that, the three governments had held an overseas promotional session for the Greater Bay Area in Paris, France in June 2018. The Tokyo event attracted approximately 1,000 participants, including 700 from either the political or business sector in Japan. In addition, the Macao SAR Government arranged for a delegation of Macao entrepreneurs to attend the event. In her speech, Ms Chan said Macao’s historic connecting role was still relevant today for the development of the 21st-Century Maritime Silk Road. She added that the city would continue to play its part in boosting economic and cultural exchanges between East and West. 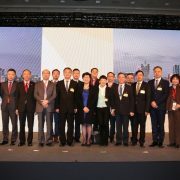 Ms Chan also briefed participants at the event regarding the unique advantages and competitive strengths of the Greater Bay Area urban cluster. During the symposium, the Chief Executive of the Hong Kong SAR, Mrs Carrie Lam Cheng Yuet-ngor, and the Governor of Guangdong Province, Mr Ma Xingrui, each gave a speech. The Guangdong-Hong Kong-Macao Greater Bay Area is a city cluster covering 11 places, namely Guangzhou, Shenzhen, Zhuhai, Foshan, Huizhou, Dongguan, Zhongshan, Jiangmen, Zhaoqing, the Hong Kong SAR and the Macao SAR. Previous: The Secretary for Social Affairs and Culture, Mr Tam Chon Weng, chairs the 1st ordinary plenary session in 2019 of the Cultural Industry Council.